For several years, Debbie Szuch has brought joy to our patients through her own personal ministry as a volunteer with Gentle Shepherd. Serving as a member of our “Gentle Shepherds” visiting team, which provides companionship to patients who live in residential facilities. Visiting with patients in their homes, perhaps reading or praying with them. Assisting GSH administrative and marketing staff with community events and sending cards, thank you notes or letters. A source of comfort, compassion, encouragement and inspiration, Gentle Shepherd volunteers find their own lives enriched through the gift of service and the privilege of being there at the end of life. 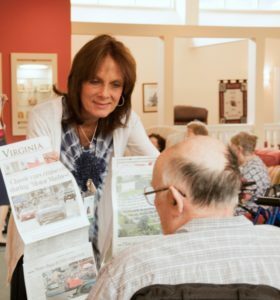 Many of our volunteers have also experienced hospice or the death of a close loved one and are more than willing to share what they have learned. Joining our volunteer family will allow you to help others in ways that are valuable, meaningful and enjoyable! If you are interested in sharing your gifts and time with our patients and their families at a time of great need, please give us a call or fill out the form below!